I'd never seen guinea hen at any store. Anywhere. Ever. But I was going to have to find it somewhere. Frankly, this dish was only high on my list of things to do because of the fregula. That sounded really good. Anyway, I figured I'd get to this dish eventually. Then one day I was at Cafe Largo in, well, Largo, on a photo shoot for a story I was working on. During a break in the action -- oh yeah, there's action at those photo shoots -- I was looking at the menu. I know: Stunning. I noticed that there was a guinea hen dish on the menu. And there was the chef, Chef Dominique. He's kinda like Madonna that way. Just Chef Dominique. "Where do you get your guinea hen," I asked. He pulled one out of the walk-in and looked at the package. "Looks like North Carolina," he told me. I meant a little more retail than that. But the brand was Joyce Farms, so that gave me something to work with. He offered to sell me what I needed, and my eyebrows stretched to the ceiling, then I decided there was probably some ethical journalistic thing that would make that a little unwise, at best. A couple days later, I get the weekly sales e-mail from the supplier in Orlando that I get some of the crazier stuff from. It said they had pork belly on sale, which only has a place in this post in that it focused my undivided attention to the e-mail. Later in the e-mail it mentioned guinea hen were on sale. 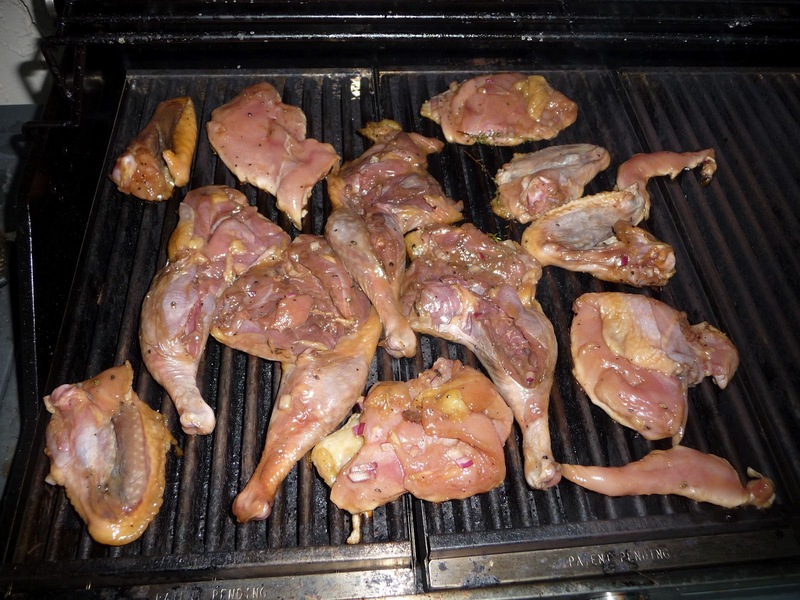 Technically, I only needed leg quarters, but that's not how guinea hen come. So I got them whole -- and they were Joyce Farms -- and quartered them. Despite the fact that the recipe only calls for the leg quarters, I grilled the whole thing, and the funny thing is, the breast meat of the hen is sort of dark. So it all worked out. The secret weapon of this dish was the pomegranate vinaigrette, in which the main ingredient is, not surprisingly, pomegranate molasses. Sweet, tangy, delicious. About the fregula: It's an odd-shaped pasta from Sardinia, sort of like Israeli couscous, but not as uniform. I had seen it, literally every time I went into Mazarro's. Never bought it. So now I need to buy it, I knew where to go. It's nowhere to be seen. Seriously? I kept going back to the shelf where it should have been, where I had seen it a hundred times, and it wasn't there. "We don't have that right now," dude behind the deli counter tells me. As he tells me this, I look up. Literally right above the guy, there is a string on which a bunch of Italian-brand pastas are hanging. The one directly above his head? 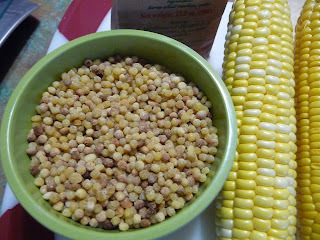 Fregula. "Can I have that one?" Truth was, it was probably 10 years old and it was dusty. I didn't really want it. But I was already annoyed at that point. They had it at Fresh Market. 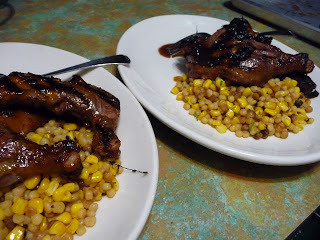 With the charred corn, this was probably the best contorni in the book. Or any other book.